It’s always great to get fresh new original music from local musicians especially musicians who are well-known in our close-knit community here in Ventura. 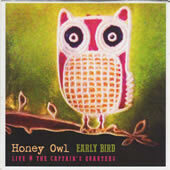 Getting together, collaborating, and then recording has yielded “Early Bird” by the newly formed Honey Owl which features Spivey Spi, Nels Rosegren, Jaymes Quirino and Megan Morris. I asked Jaymes about the way they went about producing their first effort as a band and what recorded “live” in studio means, and he explained “We played everything top to bottom with everyone in the tracking room, the only “overdubs” are the vocals including harmonies and one of spivys’ solos.” The result is raw and engaging. The songs are no-nonsense with no bells and whistles, just musicians playing from the heart, singing about real life; simply put, an honest effort. Spivey’s style is reminiscent of Dylan and Petty laying it out without apologies, though none are needed. I love the imagery in the lyrics and the complimenting harmonies and musicianship. My only complaint? There are only four songs. Alternative Rock with a Country/Americana Flair. Self described on their Facebook page: “Too blessed to be stressed. Life’s about making that Honey.” Amen! Very easy to listen to it over and over in the car (esp when only 4 songs :/ ) and love #4.